Today, in an extraordinary and rarely seen move, the CFMEU, in response to community pleas for help, has placed an historic ‘Green Ban’ on Thompson Square, Windsor. Just as, in the early 1970’s, green bans protected Australian architectural heritage and social history; today this venerable and honourable tradition has been called upon in defense of the oldest remaining public square in Australia. In the 1970’s green bans occurred against a background of the Askin Government and increasing developer power. Today’s green ban occurs against a background of eroded environmental protection and diminished heritage safeguards in response to an increasingly powerful developer lobby. In 2014 the power of development over community concerns is well illustrated by the Windsor Bridge proposal and today’s announcement is made against a backdrop of ICAC investigations into political donations, power and influence; although more sophisticated financial arrangements are evident than the infamous ‘brown paper bags’ of the past. 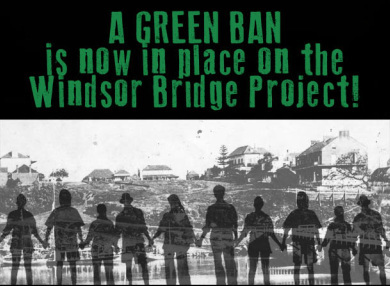 Chairman of Community Action for Windsor Bridge (CAWB), Mr Dail Miller says the group is grateful to the CFMEU for the interim Green Ban. CAWB, a local, grassroots organisation, in round the clock action, has been defending Australia’s oldest remaining public square from government plans to demolish the historic 1874 Windsor Bridge and replace it with a two-lane, modern concrete bridge and new connecting road through the Square. Since 21 July 2013, CAWB members have maintained a continuous presence in the Square to highlight the government’s plans and watch over this unique urban precinct. Their diligence was recently recognised by the State Government with a 2014 Heritage Volunteer Award. CAWB says the only logical solution is to retain and renovate Windsor’s still-sound historic bridge for local traffic and put heavy and through traffic on a new bypass, providing a further two lanes across the Hawkesbury River and potential for further, easy expansion in the future. Would you like to know more about Green Bans? Please click here for a brief history.